The new BlackVue DR500-HD is a no frills 1080p dashcam for those that don't need the GPS and WiFi option of the DR500GW-HD. This dashcam sports uncompromising video quality for those of us who just want a dashcam to be a dashcam. Simple. Sleek. Secure. 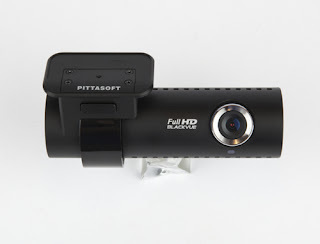 The BlackVue DR500-HD is the newest addition to the BlackVue family, as of July 2013. This ninja-black newborn is the lite version of flagship model Blackvue DR500GW-HD, where the "G" stands for GPS and "W" stands for Wifi. As a result, the DR500-HD is slightly lighter in weight, consumes less power, and easier on your virtual wallet. Fear not - the video quality is exactly the same as BlackVue's flagship dashcam. This mid-tier dashcam boasts full HD 1080p recording at 30fps, and comes readily equipped with everything you will need to get started, including a 16GB micro SD card that you can pop into the DR500-HD and get going right away (the dashcam advertises support up to 32GB). While you're at it, considering throwing in a Power Magic Pro to unlock the BlackVue DR500-HD's Parking Mode without running the risk of leaving you with a dead car battery. *A note regarding Parking Mode: The Power Magic Pro is required to enable this feature.